The sergeant-at-arms says it's disgraceful. REGINA — There's a leak at the seat of government in Saskatchewan and the sergeant-at-arms wants it to stop. 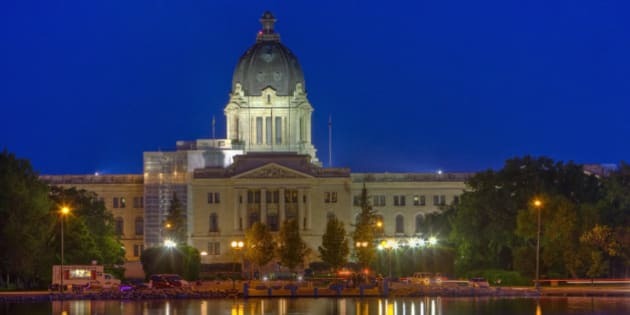 Patrick Shaw, who is also head of security at the Saskatchewan legislature, says three party bus companies have been pulling up in front of the building late at night and allowing people to pee on it. Shaw says the first time it was caught on camera was about four years ago and he was shocked. The leaking has continued and Shaw says the bus company owners "don't seem to care,'' despite repeated requests to stop. "We've been met with kind of a jocular attitude, saying: 'What can we do?''' Shaw said Wednesday. The sergeant-at-arms says staff at the legislature have poked their heads out the door to tell people to stop, but have been instructed that, for their own safety, they are not to go outside to intervene. They have called Regina police, but there is no law in the city against public urination. Shaw wants to see more done. So far, there have been no party poopers.